Gigabyte has written to HEXUS this morning to provide details of its new MA10-ST0 Atom C3000 motherboard. This is an interesting server motherboard which is built to make the most of the Intel 'Denverton' architecture. Gigabyte says that hand-in-hand the new processor architecture its MA10-ST0 "offers a whole new level of performance efficiency in the cold storage and enterprise network space". In particular, the MA10-ST0 combined with Intel's top end SKU of the next generation Atom(R) Processor C3000 Product Family, the C3958, addresses the cold-storage and network-edge needs of efficiency-conscious users. Denverton facilitates flexible integrated connectivity at low power. The previously unannounced Atom C3958 is a single-chip SoC that offers 16 cores at low power, "providing some of the highest power density (performance/watt) across Intel’s Enterprise line up." This platform is ideal for lightweight, storage-heavy applications, reckons Gigabyte. Thanks to the new architecture and 16-core Atom SoC there are plenty of I/O options in this new compact, low power design. 20x high speed I/O lanes from the CPU provide support for up to 16x HDDs or 8x HDDs, with one PCIe x8 slot, controlled by an automatic switch. This is in addition to dual USB 2.0 ports, and 2x both 10G SFP+ and 1G LAN ports. In addition to the built-in Atom processor, the MA10-ST0 includes 32GB eMMC flash memory on board, just needing some RAM installing for a quick and easy setup. The key specs are reproduced below but the full specs are available too, if you are interested. Intel currently doesn't offer any information regarding its Atom C3958 on the C-series overview pages. 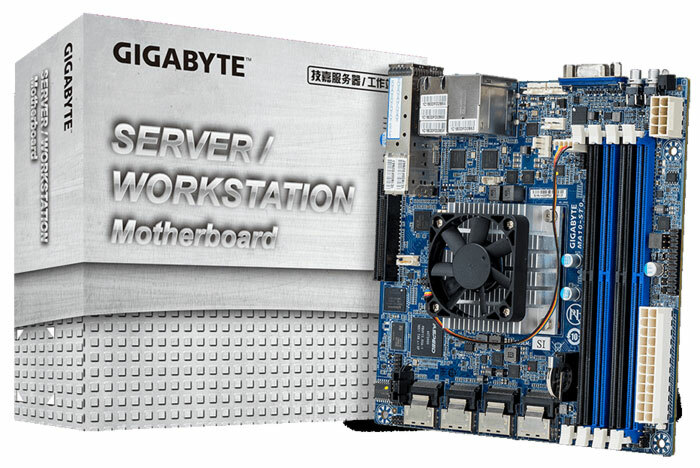 Those interested in Gigabyte's new low power server offering should contact their local b2b representative. Atom is still going stronk!